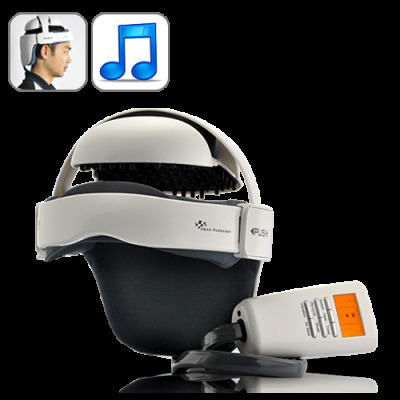 Successfully Added Digital Head Massager with Air Pressure, Vibration, Heat, and Soothing Music to your Shopping Cart. Inspired by popular Meridian treatment (Chinese medicine), this head massager is designed with seven air sacs massaging different parts of the head and neck area and acupuncture points on the top area. It improves blood circulation, promotes movement of brain cells and eases tension and pain of head. Finally, ancient Chinese medicine merges with modern technology to improve life. With four different types of music to choose from, the built-in soothing sound of this massager resonates within your brain, relieving stress, and promoting self-recovery of your brain cells. In addition, the massager also comes with a heating function to provide you with a soft warm feeling, which in turn promotes the blood circulation around the head and neck area, and further release stress and fatigue.